If you’re like me, you grew up with parents who drilled into you the art of being courteous to others, especially with regard to introductions. Challenge is when it comes to prospecting, the courtesy taught to us as a child can work against us very quickly. Put yourself in the shoes of a prospect receiving an email or a phone call that starts off with the other person introducing themselves, who they work for and what they do. When I get a message like that, I delete it in a New York second, as I know immediately it’s a salesperson trying to sell me something. Whoa! Did I just say that?! Yes, I did, because the last thing I want to be is sold to! Starting off a message about yourself is not going to get you very far. The key is to start off with a statement about something the other person will find of interest, or better yet, a question on a topic of interest in their industry, etc. You’ll have time to go into more detail after you’ve had the first conversation. Prospecting is daunting. There’s no way around it, which means for you to be successful you have to be willing to discard traditional beliefs if you expect to be successful. Engaging the prospect means asking them a question they will find of value to their interests or the job they do. The question might have to do with a key change in their industry or a competitor. If you choose to not lead with a question, then go with a statement that is again focused against an issue they’re most likely facing. You must be focused 100% in the opening sentence of your email or the first few seconds of your phone call or voicemail, hooking them with something they will see as important to them. Introducing yourself and your job title and who you work for is simply not interesting. 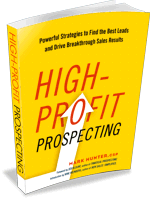 If you have not read High-Profit Prospecting where I share hundreds of strategies to make you more successful prospecting, I suggest you buy it right now. If you have read it, let others know by sharing a review of it on-line. PrevPreviousSales Motivation Video: The Big Opportunities You Capitalize On!